The Oklahoma Quality Beef Network (OQBN) is a brand-neutral, third-party health management certification program (commonly known as a VAC-45 program) for preconditioning calves that began in 2001 as a collaborative effort between the Oklahoma Cattlemen’s Association and the Oklahoma Cooperative Extension Service. OQBN certified calves are eligible to sell in OQBN-hosted certified preconditioned cattle auctions at participating livestock markets across the state. Preconditioning on the ranch for feeder cattle typically includes administering vaccinations, castrating, dehorning and weaning a minimum of 45 days before marketing, along with other common management practices. Research shows that preconditioning boosts the immune system of calves and their performance after they leave the ranch, creating incentives for stocker operators and feedlots to pay premiums for preconditioned calves (Dhuyvetter, 2003; Roeber et al., 2001). OQBN’s preconditioning protocol and enrollment forms, along with other information about the program, can be found at http://www.oqbn.okstate.edu. This fact sheet summarizes research conducted at OSU to establish the magnitude of price premiums for 2010 OQBN certified calf sales (Williams, 2011). Data were recorded at 16 feeder cattle auctions in seven different locations across the state of Oklahoma from October 27, 2010 through December 13, 2010. The data include 2,973 lots of cattle representing 25,839 head of cattle. OQBN cattle were sold at eight of those sales and account for 833 lots (28.02%) and 7,332 head (28.38%) of those totals. Data collected for each lot include sale price, lot size, average weight per calf, hide color, gender, condition (fleshiness), frame score, uniformity, health, horned status, muscle score, fill, vaccinations, weaning, preconditioning certification, age and source certification, sale location and source (seller name) announced. The weekly average price for a 750-pound steer (Medium and Large #1) from the Oklahoma City market is used as a base market price (AMS-USDA, Report KO_LS155). Feeder cattle weight ranges are limited to 300-799 pounds as few cattle outside that range are enrolled in OQBN. Table 1 shows a summary of OQBN sale data, including average lot size, average calf weight, average price per cwt by OQBN and non-OQBN calves at different sale scenarios. Note that the average calf weight for OQBN calves is higher than for non-OQBN calves at both OQBN and non-OQBN sales. The same is true for average lot size and, of particular interest, average price per cwt. One advantage of preconditioning programs beyond the health impact is the additional pounds sold at marketing since calves are held on the ranch for at least 45 days beyond weaning. Table 1. Averages from fall 2010 OQBN and non-OQBN sales at OQBN sale sites. 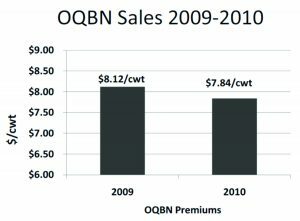 In the initial years of the OQBN program, premiums of $1.51/cwt, $3.95/cwt and $5.89/cwt were found over non-preconditioned cattle for the years 2001-2003, respectively (Ward et al., 2003). However, since OQBN’s inception, market conditions have changed. Higher prices for corn and other feedstuffs has increased the cost of finishing cattle, which in turn leads to higher morbidity and mortality costs. That is, calves with higher health potential may have greater value than in prior years. The OQBN program also has grown substantially so higher volumes of OQBN cattle are offered at OQBN sales. For buyers of preconditioned cattle, that means truck loads of preconditioned cattle are available at a single sale. Under these market conditions, OQBN premiums may be higher than in past years. One method of measuring price differences is to calculate differences in weighted average prices. Weighted average prices take into consideration how many live weight pounds are sold at a specific price. This is in contrast to calculating an average price per cwt using the average price per lot of cattle, which ignores how many pounds are sold in each lot. 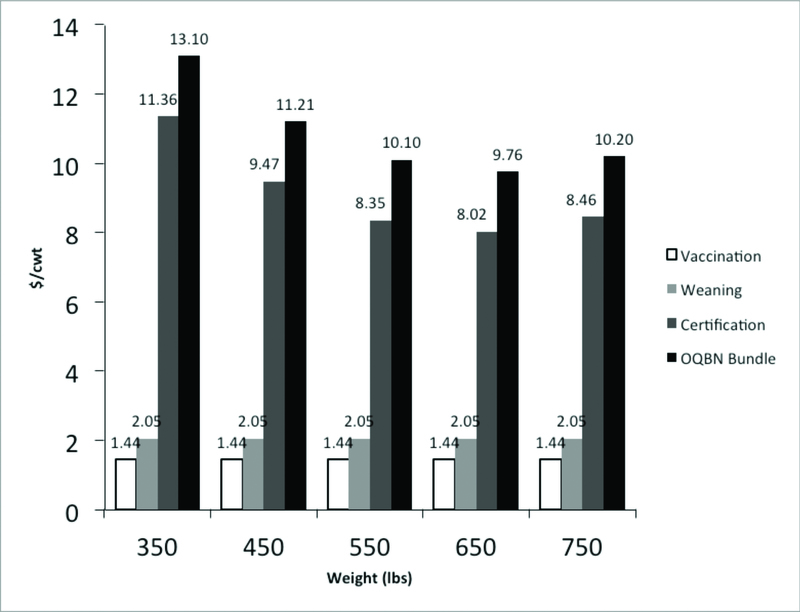 Figure 1 compares the weighted average OQBN price premiums over non-preconditioned cattle for 2009 ($8.12/cwt) and 2010 ($7.84/cwt). These measures of premium should be interpreted carefully in that weighted averages are not adjusted for any differences in quality or specific cattle characteristics. That said, weighted average prices could give a general idea of the overall magnitude of premiums. Figure 1. 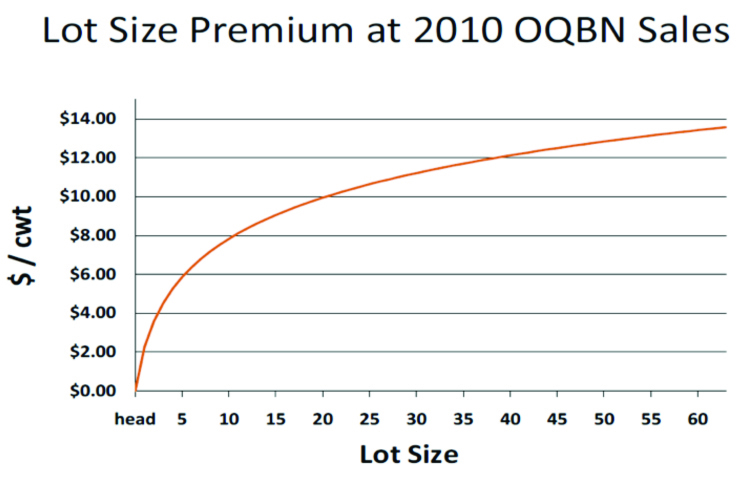 A comparison of OQBN premiums for 2009 and 2010 using weighted average prices. Various cattle characteristics influence the price received by producers. 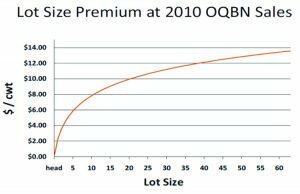 Using statistical analysis to adjust premium measures for those characteristics allows a more precise measure of premiums for specific management practices, including the OQBN preconditioning bundle. Premiums for vaccinating and weaning more than 30 days in advance of sale are estimated at $1.44/cwt and $2.05/cwt, respectively. 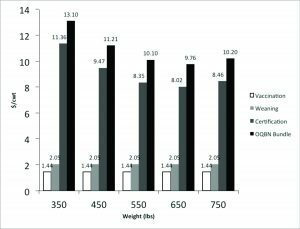 When bundled together with OQBN certification, the OQBN preconditioning premium ranges from $13.10/cwt for 350-pound calves to $9.76/cwt for 650-pound calves, relative to a similar lot of calves at a non-OQBN sale (see Figure 2). Figure 2. Fall 2010 premiums for specific practices and OQBN certification ($/cwt). Data reveal that buyers place higher premiums on certification of lighter weight calves than on certification of heavier weight cattle. Certification of preconditioning serves as a tool for cattle buyers to improve profits. Lighter weight cattle are more likely to get sick and die when moved to the next phase of production, and heavier weight cattle that are likely further from weaning have lower chances of illness. So, the benefits of preconditioning are higher for lighter weight cattle and buyers recognize the difference. Note that this analysis holds the premiums for individual health management practices (i.e. vaccination, weaning) as constant across weight categories. Buyers’ discernment of different values for different weights is reflected in the certification and bundling premium. Research has shown that larger lot sizes receive a premium and that result holds in this study as well (Figure 3). For example, sale lots containing five and 10 head receive a premium of $4.89/cwt and $7.00/cwt above the base lot size of one head, respectively. While 20- and 30-head lots receive premiums of $9.11/cwt and $10.34/cwt, respectively, over single head lots. Figure 3. Lot size premiums for fall 2010 OQBN sale locations. Table 2 reports discounts for specific cattle characteristics related to hide color, breed and gender as reflected in 2010 data. Discounts are measured relative to the base of black-hided steers and are independent of OQBN affiliation and sale location. Results reported here are similar to those reported in previous studies. Dairy or Longhorn lots received the biggest discount at $27.71/cwt, while lots that were mostly black or lots that contained all white/grey cattle received relatively small discounts of $1.21/cwt and $1.81/cwt, respectively. Lots recorded as Brahman-influence received a discount of $3.48/cwt, in addition to any existing discounts for hide color. The discount for heifers is significant, as expected, at $11.78/cwt. Lots containing mixed gender or bull calves will cost producers $5.78/cwt in reduced sale price. Table 2. Discounts for specific cattle characteristics in OQBN and non-OQBN sales, fall 2010. *Brahman influence discount is in addition to hide color discounts. The 2010 OQBN program had a significant economic impact on the Oklahoma cow/calf industry. Approximately 81 percent of cattle enrolled in the program were sold through OQBN certified sales, while the other 19 percent were assumed to be direct marketed based on interactions with OQBN producers. For OQBN calves sold at OQBN sales, vaccinating and weaning added approximately $141,000 over non-preconditioned calves. However, when OQBN certification is included, the overall increase in revenue for OQBN calves sold through 2010 OQBN sales was $417,840. Assuming an average weight of 550 pounds for direct marketed calves, OQBN certified calves sold outside of OQBN sales are estimated to have increased returns of approximately $95,800 over non-preconditioned calves. The estimated overall impact of OQBN for 2010 totals approximately $513,700. Producers also realized additional benefits due to additional pounds sold after 45 days of preconditioning. Data, however, are not available to compute the net value of that gain. Dhuyvetter, K. 2003. “Preconditioning Beef Calves: An Economic Analysis.” Paper presented at Beef Stocker Profitability Conference. Manhattan, Kansas, September 29, 2003. Roeber, D., N. Speer, J. Gentry, J. Tatum, C. Smith, J. Whittier, G. Jones, K. Belk, and G. Smith. 2001. “Feeder Cattle Health Management: Effects on Morbidity Rates, Feedlot Performance, Carcass Characteristics, and Beef Palatability.” The Professional Animal Scientist 17(1):39. Ward, C.E., C.D. Ratcliff, and D.L. Lalman. 2003. “Price Premiums from the Oklahoma Quality Beef Network.” Oklahoma Cooperative Extension Service Fact Sheet AGEC-599, Division of Agricultural and Natural Resources, Oklahoma State University. Williams, Galen S., Unpublished Master’s Thesis. “Feeder Cattle Premiums From A Certified Preconditioning Program.” Oklahoma State University, May 2011.